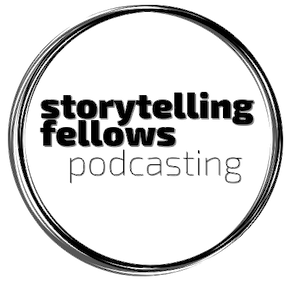 Welcome to Storytelling Fellows: Podcasting, a multi-week completely online workshop for graduate student researchers. Each quarter, up to 10 students, or Storytelling Fellows, will be tasked to generate a podcast in 3-4 weeks. Every week of the workshop features a set of self-directed learning materials, ongoing conversation and discussion, and a weekly live online meeting where members of the Storytelling Teaching Team and the workshop cohort get together to discuss production progress and status updates. If you're interested in learning more, contact libstory@uw.edu for information. And if you would like to join us, consider registering for the next upcoming workshop. This intensive workshop will guide you through the development of your own podcast production. You will discuss how you came to your research, what motivated you to become a researcher, and where your research is taking you. Podcast formats such as interviews, investigative reporting, solo/panel/team commentary, and more are discussed. Produce a short 2-5 minute podcast segment by recording, editing, reviewing, transcribing, and reflecting on your work. Identify a number of tools, platforms, and strategies for developing and hosting a podcast. Learn about the importance of accessibility, preservation, open access, and digital safety. Students are expected to draft a podcast production plan and will submit a complete transcript (Acts, Tracks & accessible transcription) of their production. Cohort members are asked to participate actively in workshop discussions and are required to attend live synchronous session as scheduled. During the course, students will share their progress and questions regarding their digital stories with the Teaching Team and fellow participants. Each student is expected to attend three 90 minute synchronous meetings, and one listening party to be scheduled at a later date. How does the Storytelling Fellows workshop work? Your main mode of communication with the Teaching Team and other Fellows will be Slack. You’ll want to get acquainted with Slack as soon as possible and check it regularly throughout the workshop. You can set it up to alert you to new messages. We really like the mobile app as well as the desktop version! During the workshop’s three-week span, the Teaching Team is open to holding drop-in hours via Zoom, so that’s something that can be discussed and organized in Slack. The members of the Teaching Team work at UW Seattle, so if you’re on that campus, you can arrange to meet with them face-to-face if you prefer in-person consultations. You can find all the teaching materials on the workshop’s website. Check out the workshop’s syllabus to get an overview and a sense of the timeline. In the “Modules” tab, you’ll want to review all the genres of podcasting in order to decide if your project fits within one genre or combines two or more of them. All assignments are due on the Friday before our Sunday web-conference session. You will submit your written work and MP3s in a Google folder that’s been set up for you in Google Drive. For your assignments, you will have an option of Three Tiers to aim for. Meeting Tier 1 requirements means that you’re doing the minimum amount of work and you may that you could be falling behind. Meeting Tier 2 requirements indicates that you’re right on track. Tier 3 means that you’re a little bit ahead. More information on these tiers is listed on the Resources page. As you navigate through the website, you will see badges attached to assignments that correspond with its tier level and session. Session 1, Tier 1 Assignment Make the podcast intro. Session 1, Tier 2 Assignment Make the podcast intro and have an idea for your own podcast. Session 1, Tier 3 Assignment Make the podcast intro, have an idea for your own podcast and have a plan for how you'll do your podcast. Use these badges as indicators and reminders for upcoming sessions and assignments. Create a Zoom account and download the Zoom client. Use a headset or earbuds for synchronous sessions. This workshop utilizes a real-time collaboration and communication tool known as Slack. Participants will join a Slack team for this workshop and are encouraged to use this tool for discourse and discussion. Students will record their narratives on audio recording equipment available to them through their affiliation with UW, or on personal equipment such as smartphones or similar devices. UW students have access to the Student Tech Loan Program, the Odegaard Library Sound Studio, and the UW Libraries Media Arcade. Our workshop is a safe space for open discussions. We embrace and support diversity and inclusion within this workshop and at the UW Libraries. We hope to foster unique representations of ideas and experiences. This online workshop and its synchronous meeting sessions will remain welcoming and supportive to allow participants to thrive creatively as a researcher and online learner. The UW Libraries makes a commitment to provide accessible accommodations for workshop participants. If you have already established accommodations with Disability Resources for Students (DRS), please communicate your approved accommodations to us (libstory@uw.edu) at your earliest convenience so we can discuss your needs in this course. If you have not yet established services through DRS, but have a temporary health condition or permanent disability that requires accommodations (conditions include but not limited to; mental health, attention-related, learning, vision, hearing, physical or health impacts), you are welcome to contact DRS at 206-543-8924 or uwdrs@uw.edu or disability.uw.edu. DRS offers resources and coordinates reasonable accommodations for students with disabilities and/or temporary health conditions. Reasonable accommodations are established through an interactive process between you, your instructor(s) and DRS. It is the policy and practice of the University of Washington to create inclusive and accessible learning environments consistent with federal and state law. We are celebrating the spirit of open access by providing this workshop content outside of the traditional learning management system. As such, we are working in open tools (Audacity) on open platforms (github pages). All users are welcome to replicate this website through github using a CC By license. This workshop will provide information on Creative Commons licensing, how to obtain free music to include in your production, and how you can contribute to the spirit of Open. Working openly can also give way to more vulnerability of your digital safety, privacy, and identity. As you increase your propensity to share more about yourself and your work online, you become increasingly exposed to personal risk. In this workshop, we will talk about ways to safeguard yourself from some of these risks and how you can start incorporating privacy-enhancing tools and practices into your daily routine. Identifying proper metadata is an important aspect of preserving your podcast productions and helping to "future-proof" your content so that it can live well beyond the shelf life of your audio files. This workshop will touch on aspects of metadata, help you arrangement your files with naming conventions, think through some hosting options, and provide strategies for preserving your work for the long haul. Check out Preserve This Podcast for more on the importance of podcast preservation.